The Nutrition Facts Panel on the food label is a handy tool for making smart food choices that fit your diabetes meal plan. Serving Size: The serving size is based on government information about the standard amount people commonly eat, but this isn't necessarily the amount you should eat. 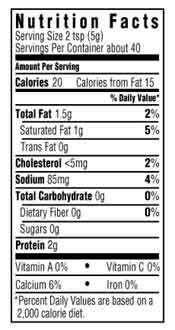 Other information on the label (calories, fat, etc.) is based on serving size. Compare the amount you actually eat to the serving size listed and, if they're different, adjust the nutrients up or down. Eating too much or too little can affect your blood glucose level and your weight. Tip: To get the Nutrition Facts for your typical portion size, weigh or measure the amount and compare it to the serving size and nutrition numbers listed on the label. For help estimating serving sizes, see our Portion Size Guide. 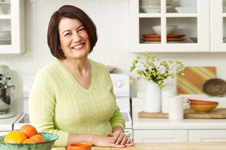 Calories: The Nutrition Facts Panel lists the number of calories in one serving. This information is especially important when you're managing your weight. Tip: At the grocery store, use labels to compare the calories per serving in similar types of foods so you can make the best choice for your meal plan. Be sure to compare serving sizes, too. Total Fat, Saturated Fat and Trans Fat: When you have diabetes, it's smart to watch the amount of fat in your diet, especially saturated and trans fat, which can increase your risk for heart disease. Use the label to balance higher fat foods with lower fat and fat free choices throughout the day. Tip: Some labels list polyunsaturated and monounsaturated fat. These fats are nutritious choices but have the same number of calories and fat grams as other fats, so keep the amount you eat within the limits of your eating plan. Total Carbohydrate: This number totals up the grams of complex carbohydrates, sugars, fiber and sugar alcohols in a serving of the food. Use this information if you are carbohydrate counting or want to figure out how a food fits into diabetic exchanges. Tip: Carbohydrates from any source affect your blood glucose level, so look at the total grams of carbohydrates in a serving, not just the grams of sugars. Tip: Because sugar alcohols used as low-calorie sweeteners in certain foods don't raise blood glucose as much as the same amount of other carbohydrates, you may subtract half the sugar alcohol grams from the total carbohydrate grams and count the remaining grams. Vitamins and Minerals: The label shows the Percent Daily Value for vitamin A, vitamin C, calcium, iron and sometimes other vitamins and minerals. The percentage tells you how much of each nutrient a serving of the food contributes to daily recommendations for a 2,000-calorie diet. This information helps you make nutritious food choices. Aim for 100 percent of each vitamin and mineral per day. Exchanges: Some food labels and recipes list the exchanges per serving to help you if you are following the Exchange system for meal planning. Choices are another system of meal planning that can used with food label information. Some recipes also list Carb Choices. Learn more about reading nutrition facts when you have diabetes.